Hidden far away from our time lies a valley full of unimaginable riches. Adventurers from all over the world set off to try to make their fortunes here. 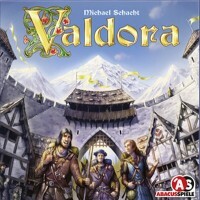 Players purchase equipment and commissions in Valdora's cities. Only with the help of special equipment can they dig for gold and various gemstones. If a player undertakes a commission and delivers the requested gemstones to the house of his patron, he earns victory points. Additionally, he can hire a craftsman. Each craftsman specializes in gold, silver, or specific gemstones. The first player to have enough craftsmen wit the same specialization may open a workshop. Workshop owners receive bonus points. 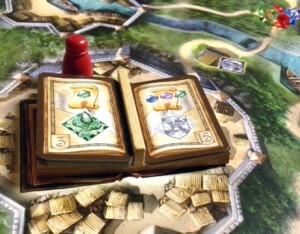 At the end of the game, players earn victory points for their workshops, craftsmen, and gemstones. The player with the most points has made his fortune in Valdora and wins the game! Who left all these gems piled up in the middle of the road?!?! 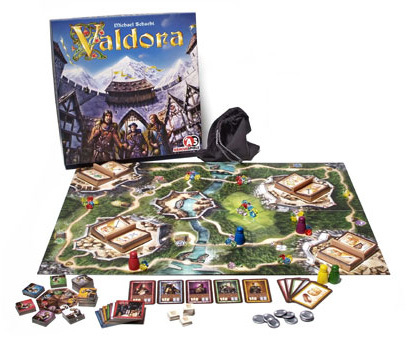 To me Valdora is like Dominion, it has something really great going on but could possibly be taken a step further in terms of themeing with mechanics. This game lets you move your little bowling-pin-dude as many spaces as you want as long as someone or something isn’t stopping you. Each turn is quick. Many boardgames use an action point system for movement(Arkham Horror, Adventurers, Defenders of the Realm), in other words you can only move a set number spaces each turn. After having gamed under the action point allowance’s tyranny I felt a strange sense of freedom. You go around collecting jewels in order to complete commissions that are picked up in the cities. Completion of a commission awards you craftsmen and eventually workshops. You are awarded victory points as you complete commissions. If you have a chance to play this game I would recommend it, but it is hard to find in the US. Another neat aspect is the wooden card holders that you flip through as if you’re turning pages in a book, what this has to do with anything I am unsure but it is definitely reinforces the “Germani-ness”. If you look at the “town” that surrounds the giant book I think the roofs look like cereal. Add a Review for "Valdora"